The photo above was published in the Joongang Daily of South Korea yesterday. It ran with this caption. About 200 tons of blue fin tuna are auctioned at a fish market in Busan yesterday. Seven fleets of tuna fishing boats caught the school of blue fin tuna on Sunday east of Jeju Island. 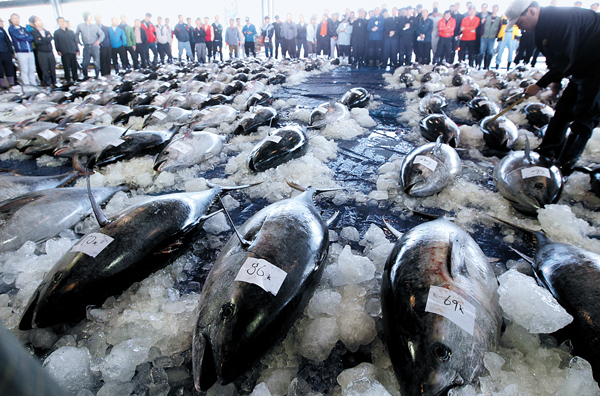 The total amount of blue fin tuna auctioned off this year by last Sunday was 109 tons. An 84-kilogram (185-pound) tuna sold for 2.4 million won ($2,000) at the auction. “Japan’s Fisheries Agency revealed that it had received a response from the South Korean government in regard to their July request that South Korea limit its catch of bluefin tuna. The agency said the Korean answer was that it would be “difficult” (i.e., it’s not going to happen). “The agency also said it would study the reply carefully to determine its response. 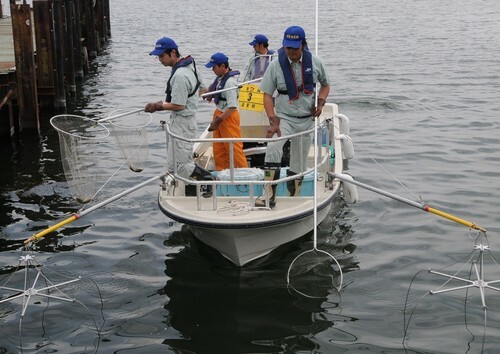 According to the agency, the South Korean government explained that one of the reasons their fishermen catch so many bluefin tuna is that the fish accidentally get caught in their nets spread to catch aji and saba (two varieties of mackerel). The South Korean government said it was not intentional. 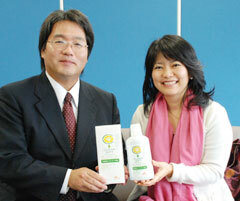 The agency added that South Korea recognized the necessity for international cooperation in resource management. 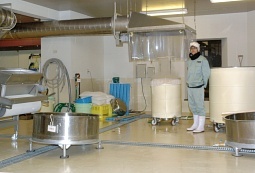 The South Koreans also asked Japan to provide data on their bluefin tuna imports. SOCIAL critic Miyazaki Masahiro offered some observations on recent trends in Chinese cuisine earlier this week. Here they are in English. With everything else being destroyed in China, is the core of their food culture also at risk? Shark fin soup, the sine qua non of sophisticated Chinese cuisine, has become a target of attack. 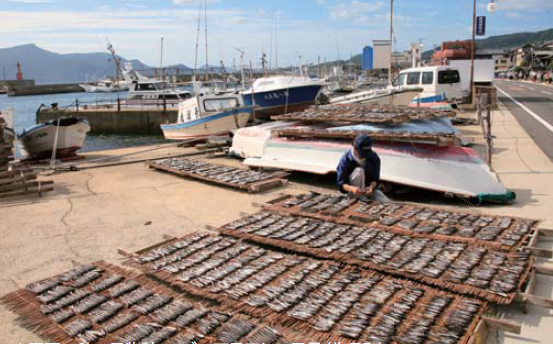 This has surprised both the Chinese and the Japanese, who export shark fins to China. Activists have converged on Shanghai to strip the Chinese of their dietary culture by demanding that people stop eating shark fin on some pretext or other — environmental protection, ecological protection, anything will do. Japan has been deprived of the whale. In China too, bear paws and dog meat are now de facto illegal. (Manchuria is an exception. There, dog meat restaurants still flourish.) Stewed bear paw has, for all intents and purposes, been banned for about two years. The primary reason cited was hygiene, and now there is mock bear. But bear paws are considered an indispensable part of elegant dining, though it took a month of stewing in a pot to soften them and remove the toxicity. Whole grilled squab is popular in Guangdong, but the shops serving civet have disappeared from the main streets. A campaign promoting a trial tasting of dog meat had been scheduled, but was canceled. And then there is shark fin. It’s said that 30% of the world’s shark species are threatened with extinction, and most of those have disappeared into Chinese stomachs. China imports most of its shark fin from Japan. 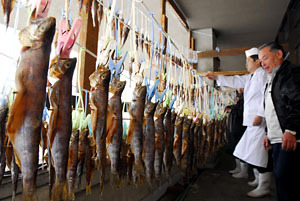 It became so scarce after the Tohoku earthquake that local fishermen began receiving premium prices. WildAid was held on 22 September 2011 in Shanghai, and many Chinese were surprised to see basketball star and national hero Yao Ming in attendance. Most Chinese love shark fin soup (N.B. : It’s traditionally served at wedding banquets), and a controversy erupted when Yao Ming and Richard Branson, chairman of the Virgin Group, held a news conference to declare that eating shark fin was barbaric and should be banned. I wonder — is this the first time Chinese food culture has come under simultaneous attack from inside and outside the country? The World Park Junkies have survived all these years, so maybe shark fin soup will too. MUNICIPALITIES everywhere hold special events outdoors when the weather gets nice, and often those events include large fireworks displays. As you might imagine, summer galas with fireworks are common in Japan. My wife’s family home is near a river, and the second floor of the house offers an excellent view of the local fireworks festival. Our house is a 10-minute walk from the municipal offices, where another fireworks extravaganza is presented every year. Not many of the summertime events I saw in the United States started off with a special ceremony. For the fireworks festivals, people just head for a site with a good view and wait for the light and sound show to begin. That’s not usually how it happens in Japan, however. People here like to hold a ritual/ceremony/event first to get off on the good foot, even if it’s small and few people attend. One opening ceremony that’s particularly appealing is conducted by the people who present the annual Hita River Opening Sightseeing Festival in Hita, Oita. The city is on the Mikuma River and likes to promote itself as a hydrophiliac municipality, so that’s where the events take place. As they do every year, the city began their 63rd festival this year with a small observance to thank the river divinities and ask their blessing for a safe event. 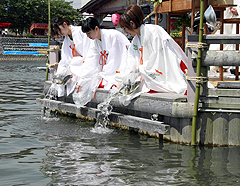 Three young women, serving as the public relations face of the festival, dressed as miko (Shinto shrine maidens) and released 34 ayu, or sweetfish, into the river from the edge of a small stage. Is that not a short but sweet gesture that shifts the emphasis from receiving to giving, and a gentle reminder of that which should come first? About 90 people came to watch, including local government officials and representatives of the tourism industry. A much larger number of people came to watch the fireworks, in which 10,000 individual devices were released into the sky over the next two nights. There’s also what the Hita folk call the Hangiri Gempei Contest, which involves goofy competitions on the river. In one of them, individuals dressed in unusual costumes climb into what look like oversize wooden washtubs to do battle and try to capsize each other. They probably laugh themselves silly while everyone else enjoys the scene from the riverbank. This is the first public event of summer in Hita, so it’s held at the end of May every year. The story got lost in the shuffle among the other files on my computer, but I thought it was good enough to present even if it is two months late. And speaking of good sweetfish stories, here’s another one about taking the ayu from the river instead of putting them back in. Oh, and before I forget—here’s a superb photo of the fireworks over the river. What the heck! To find out what’s been going on in Kyushu this weekend, take a look at the mad morning dash in Fukuoka City, the Kagoshima lanterns, and weather forecasting using the Divine Wind. I’m tellin’ ya, this is a happening place! But how long can she hold her breath? ANOTHER SMALL STEP for Japanese-Korean amity was taken last week during a forum in Toba, Mie, convened by female divers to discuss their efforts to register their way of life as a UNESCO intangible cultural property. For centuries, women in both countries have dived without mechanical aids to catch abalone and other shellfish for a living. 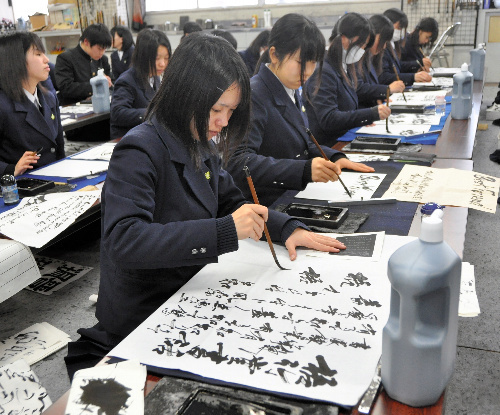 Japan and South Korea are the only countries in the world where it is a tradition for women to engage in this income-generating activity, and the working women of both countries have been forging closer ties in recent years. The Koreans initially approached the Japanese, as described in detail in this previous post. That they should work together is only natural—both groups of divers have a long tradition of working in each other’s country. And Toba was a natural place to meet, as half of the Japanese female divers live there. While most of the ama attending were from Japan—63 came from nine prefectures—one of the Jeju Island haenyo participated, as well as a Korean researcher. The women shared their experiences in addition to discussing strategies for receiving UNESCO recognition. 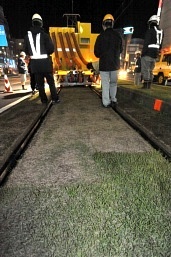 One participant said she had been born and reared in Tokyo, but was so eager to do the work she moved to Chiba. 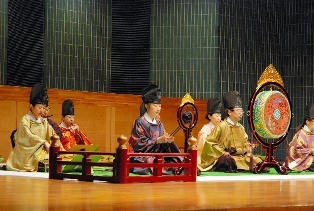 The Korean woman sang the traditional haenyo song. Another diver who showed up and spoke at the forum was 19-year-old Omukai Chisaki, who is perhaps the first female abalone diver contracted for work because she catches the masculine eye as well as she catches shellfish. Ms. Omukai, hired specifically to serve as a tourist attraction, dives for abalone and poses for snapshots during the summer months in Kuji, Iwate. Perhaps she offered her fellow divers tips on cosmetics that retain their luster after long hours toiling underwater and the most fetching angle to place the goggles on the head when being photographed. Speaking of photos, the accompanying screenshot shows why she was a hot topic this summer among Japanese weekly magazines and TV programs, despite the caption that says she is shivering. 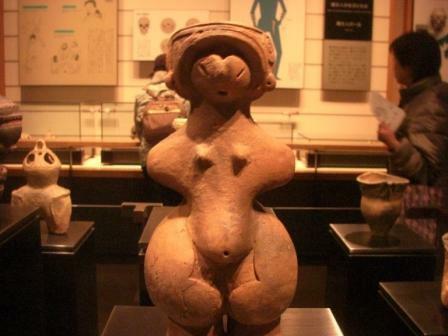 The shared culture meant that she also generated considerable buzz across the Korean Strait. 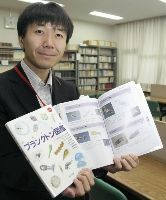 A South Korean news report on Ms. Omukai’s summer job ranked fourth in total hits as a search topic in library computer systems on the day it appeared. The elites won’t like to hear it, but it’s no surprise that cuteness provides more juice to bilateral relations than a boatload of summit meetings and academic conferences. Perhaps sending UNESCO officials to see Ms. Omukai in action would seal the deal for the organization’s approval. Seeing is believing, after all. BAREFOOTIN’ IN TEE-SHIRTS and short pants, all the better to deal with the 30-minute turnarounds of pouring rain and blazing sun: yeah, summer has arrived at last in Japan. During the dog days, the archipelago offers all sorts of hot-weather delights, including watermelon, shaved ice, and best of all, the transformation of even the most neo-radical of young women into traditional beauties once they exchange their jeans for yukata (a summer kimono). What else is going on up and down the islands? Well, take a look and find out! Once upon a time, summer nights on the East Coast of the United States came alive with a light show au naturel created by fireflies. The march of progress and suburbia seems to have ended all that, but the lightning bugs, as we used to call them, are still alive and flickering in the countryside here. This is Japan, so take it as given that people know just when to expect their appearance every year, just how long it will last, and how to organize the viewing parties and festivals held to coincide with those dates. The photo shows the fireflies near the Ayu River in Tanabe, in the southern part of Wakayama. It’s one of several locations in the area known as superb firefly viewing sites from the end of May to the beginning of June. But as with the cherry blossoms and the rainy season, the firefly front keeps marching north, and right now the folks in Yonezawa, Yamagata, are enjoying a month-long firefly festival at the Onogawa spa. 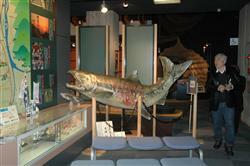 The festival is sponsored by the spa’s tourism association and the Yonezawa Firefly Protection Society. The opening ceremony was held at the local memorial firefly tower to pray for the safety of the participants during the event. Those Yonezawans must really like fireflies! 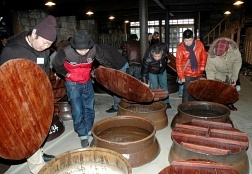 It’s not a festival in Japan without liquor, so right after the prayers they perform another centuries-old ritual by knocking open the head of a sake barrel with wooden hammers and passing the hooch around. They say some people see double when they drink too much, so you can imagine the sort of visions that light up the retinas of the festival-goers when a wave of fireflies floats by. 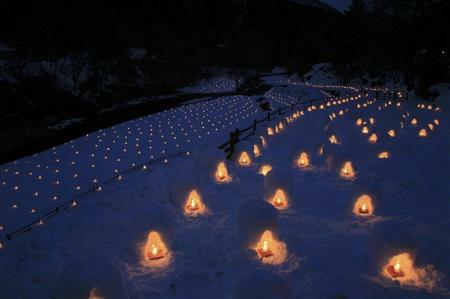 The viewing in Yonezawa begins on the riverbank right after it gets dark at 8:00 p.m. and lasts until 9:00. The area is such a firefly mecca that three different species breed here, and who but the entomologists knew there were different types of lightning bugs? For a spot of relaxation after all this excitement, the open-air baths stay open until nine, and there’s a tea house set up temporarily next to the firefly tower. The festival fun lasts until 31 July, but some people like to time their visit for the amateur entertainment contest on the 4th and 5th. Sliding over from zoology to botany, here’s a photo of the festival held by the Miyajidake Shinto shrine in Fukutsu, Fukuoka, for the first cutting of Edo irises in a local garden. The purpose of the event, called Hatsukiri—first cutting, appropriately enough—is to present the irises as an offering to the divinities. They’ve got plenty of flowers from which to choose, because the garden has 30,000 individual plants. While the priests grunt, bend over, and swing their scythes, two miko hold irises as they perform a dance accompanied by a flute. More than 200 people came to watch. A small turnout, you say? That’s not a bad crowd for watching two girls perform a centuries-old dance in costume in a garden in a town of 56,000 while priests cut flowers. How many people would show up where you live? 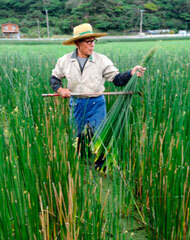 Irises weren’t the only flora getting cut for a Shinto ritual. Four priests from the Futamikitama Shinto shrine in Ise, Mie, boarded a boat with some miko and sailed offshore for some seaweed cutting. They present the seaweed—fortunately an uncountable noun—to the divinities, allow it to dry out for a month, and then distribute it to their parishioners to drive out bad fortune and eradicate impurities. At 10:30 a.m., the priests set sail on their skiff festooned with red, yellow, green, purple, and white streamers, with bamboo grass placed at bow and stern, and headed for the special seaweed site 770 meters northeast of the Futami no Meoto, sometimes called the Wedded Rocks. 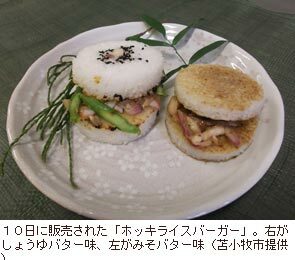 (The word meoto designates a pair of something, one large and one small.) 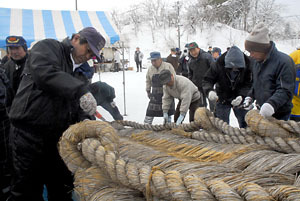 Since this is a special ritual, they can’t just start cutting—first they have to circle the divine Kitama rock on the seabed three times, then they haul out a three-meter long sickle and get to work. 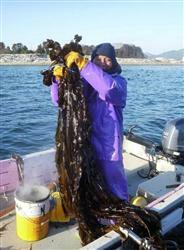 The center’s director said they discovered these particular sea grapes among a batch imported in March 2008. 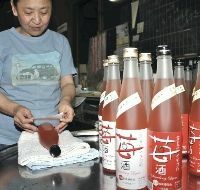 The new variety flourished in the southern climate, and that gave people the idea to turn it into a new product, particularly as they were looking for ways to juice the market after the prices of regular sea grapes and mozuku seaweed tanked. They decided to call the new plant sea goya because it’s more elongated than regular sea grapes and has the bitter flavor of goya. The center has already applied to register the name as a trademark, and they’re confident the application will be approved. After hearing about the new product, more than 10 companies inquired about handling the distribution. After insects, irises, seaweed, and sea grapes, here come the freshwater fish: namely the ayu, or sweetfish, which we’ve encountered before in a post about their encounters with traditional traps. 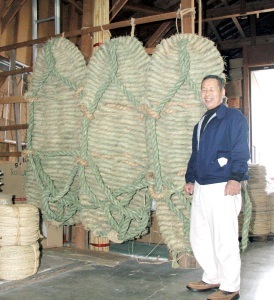 Six keepers were employed to catch the fish at the Imperial fishing grounds on the Nagara River in Gifu City, but the keepers can handle up to a dozen birds on the end of ropes, so they must have taken quite a haul. They go out in boats too, but at night, and they take along lighted torches. The fish are attracted to the flame like maritime moths, and the birds dive in after them. The lower part of the cormorants’ necks are collared to prevent them from swallowing the fish, and after they’ve snatched one, the keepers reel them in and make them cough it up. That’s got to be more cruel than feeding a dog peanut butter. 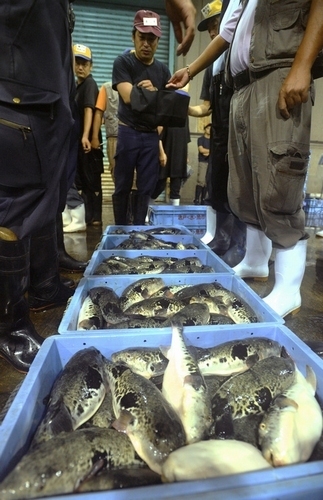 The fish were packed into paulownia boxes and shipped to the Kashihara-jingu, a Shinto shrine in Kashihara, Nara, as well as the Imperial Palace and the Meiji-jingu, another Shinto shrine in Tokyo. 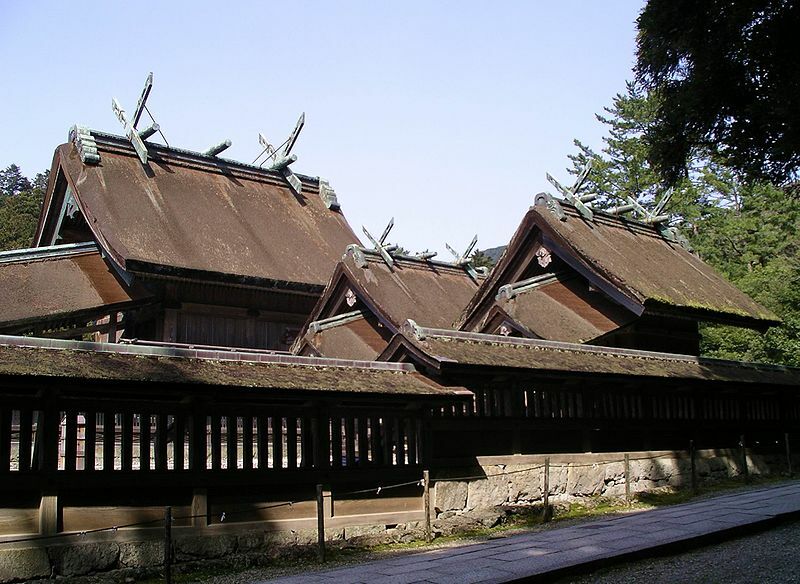 Both shrines have an Imperial connection. Yet another sign of summer in Japan is the yaoyorozu of rice-planting festivals held throughout the country. It’s easy to figure out why—they grow the rice in wet paddies, which are made even wetter by all the rain that falls this time of year. 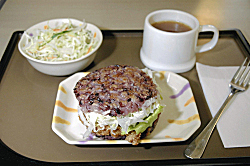 But the students at Miyoshi High School in Miyoshi, Tokushima, weren’t planting this rice as part of a festival; they were getting classroom credit. The lads aren’t planning to be farmers when they grow up–rather, they’re enrolled in a course covering the brewing and fermentation of food products. They’ll harvest that rice in the fall and use it to make sake. The rice is grown on a 3,000-square-meter paddy the school rents from area residents. The teachers do most of the planting with a machine, and then some of the second year students wade right in and plant by hand those parts the machine can’t reach. They expect to harvest 1.5 tons of the rice in mid-September, which can probably be converted into enough sake to keep the town of Miyoshi more lit than a riverbank full of fireflies until New Year’s. The school started the project last year, and this year they increased the size of the cultivated area six-fold to use only the rice grown by students. 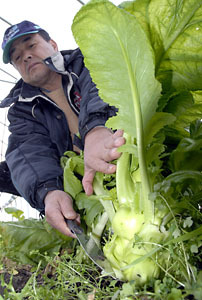 One of those students, 16-year-old Fukuda Shinya, had planted rice before, but he said the seedlings were more difficult to handle because the size was different than that of regular table rice. Now why couldn’t I have gone to that school! 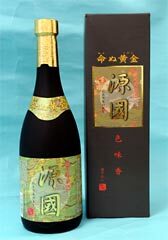 While the high school students were outdoors sweating and getting dirty as they planted the rice for the sake they will later brew, Masuyama Hiroki (73) of Izumi, Kagoshima, was relaxing with an adult beverage as he contemplated the success of his 12-year effort to collect one bottle each from all the prefecture’s shochu distillers. 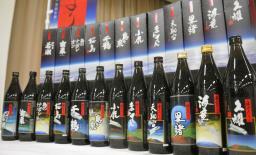 This is Kagoshima, where everyone drinks shochu and almost no one drinks sake, so he had his work cut out for him. He’s so proud of his accomplishment he’s got them lined up on the wall, and hasn’t twisted the cap on a single bottle. 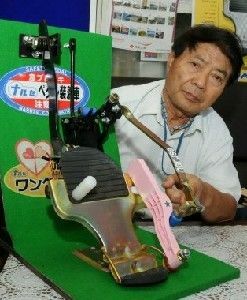 Mr. Masuyama decided to make it is hobby after he retired from a job with the prefectural government in 1996 and started working in sales. 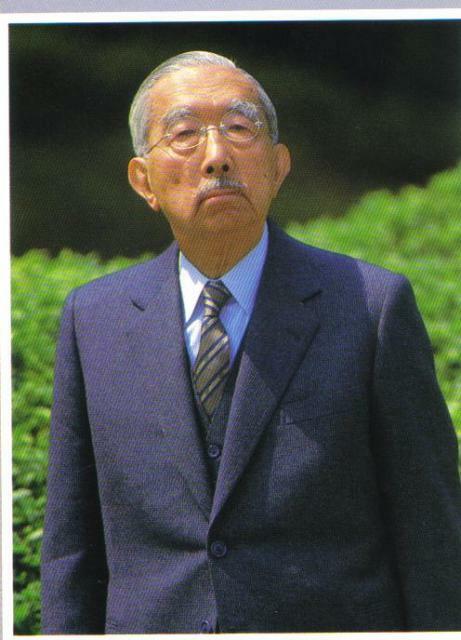 His business trips took him throughout Kagoshima, and after he got the idea—probably in a bar during one of those business trips–he made a list and started buying while he was selling. He started with 1.8 liter (1.92 US quarts) bottles, but they were too heavy and took up too much space, so he switched to bottles half that size. He had a few difficulties completing the collection, and no, one of them wasn’t a tendency to polish off a bottle before before he could display it on the rack. For one thing, the smaller bottles were sold mainly to commercial establishments, but he applied his salesmen’s skills to get what he wanted. 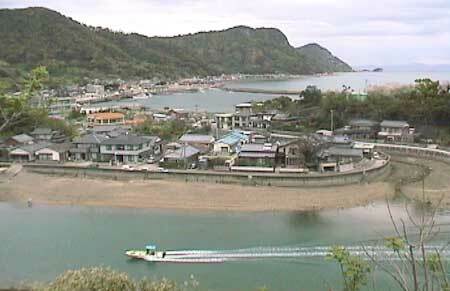 Another was that he didn’t have much of a chance to go to the prefecture’s many outlying islands on business. After retiring from his second job, it took two more years to finish the project. Mr. Masuyama says he enjoys looking at his collection while having a late-night drink, but his libation doesn’t come from those shelves on the wall. He hasn’t opened any of the bottles and says it would be a waste to drink them. Now there’s a man with discipline! Shinto shrine maidens, known as miko, get to do all sorts of fun stuff. In this post alone, they’ve sailed out to the Wedded Rocks to help the priests cut seaweed, carried the sacred sweetfish caught by cormorants, and danced while the priests cut Edo irises in Fukutsu. Even better, they get to handle the money at the shrine during New Year’s. Doesn’t that sound like a great part-time job? If that’s the kind of work you’re looking for, the Kanda Myojin Shinto shrine in Chiyoda, Tokyo, is offering a beginner’s level course that provides instruction in how to become a miko. Even better, the class will last only one day, on 17 August—the middle of summer vacation! Kanda Myojin conducts the class every year with the idea of giving young Japanese women a better idea of their traditions and culture, as well as teaching them more about the shrine. Last year, the student body consisted of 24 women who got to wear the red and white outfit for a day as they studied the shrine’s history, the daily conduct of affairs at the shrine, and its religious ceremonies. Considering they charge only JPY 5,000 yen ($US 52.40), that sounds like a good deal. They’re looking for 20 unmarried young women this year from 16 to 22, and enrollment is open until the end of the month. Start with a party, end with a party. This particular hoedown is the eisa dance native to Okinawa. Centuries ago, it was performed as a rite for the repose of the dead, but now it’s done for entertainment and is more likely to wake the dead than ease their way into the next world. Okinawa City issued a proclamation declaring itself Eisa Town earlier this month, and held a Declaration Day Eisa Night event outside the city offices to lay claim to the title. Six groups made their eisadelic statement as they performed in original/trad clothing they created themselves. Eisa Night means that eisa season has officially started in the city, and summer in this city means that local youth groups will give public performances every weekend until the really big show, the Okinawa Eisa Festival in September. During her greeting at the ceremony, Mayor Tomon Mitsuko said, “We hope you come to Okinawa City on the weekends and enjoy yourselves.” Then the dancing started and everyone proceeded to do just that. It’s not just for the Ryukyuans, either. 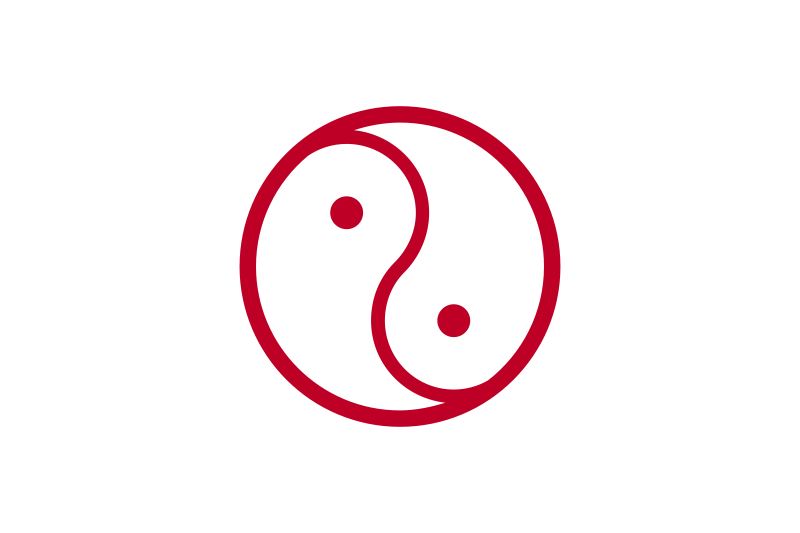 One of the six groups performing was the Machida-ryu of Machida, Tokyo, who started their own group in 1999 after a trip to Okinawa. They were so captivated by the dance they had to do it themselves at home. Now the troupe has more than 100 members. There’s an idea: create your own Okinawan dance and drum ensemble and visit Eisa Town next year. If you want to learn, watching the video is a great way to start!